As we near the end of 2018, we’re here to show you how to create this DIY New Year card. This is a fun and easy pop up design that can also be used as a New Year greetings card or a table display for a New Year’s Eve party or dinner. What’s great is that this design will also fold flat so that you can pop it in an envelope to post it and spread some New Year Cheer! This design, based around stars, could also be used as a birthday or personalised card, simply add different letters or numbers for years and ages. This card was designed for us by the super talented Angela Dodson. Angela has also created a free template to make creating this card even easier. Download and print our template pack, where you’ll have all the elements you need to create this card, here. 1.Cut White Card to 24cm x 8cm, place with long side across scoring board and score down at 5.5cm, 11cm, 16.5cm & 22cm. Mountain fold at all four score lines and join using the small tab to form a square. Cut four pieces of gold striped paper approx. 5.2cm x 7.8 to cover the four sides. You can also find the template for this, here. 2.Cut two strips of white card 7.5cm x 2cm, place with long side across scoring board and score down at 1cm and 6.5cm on each strip. Fold at the score lines, add glue to the end tabs and then adhere both inside the box section as shown below, spaced apart. Fold box down and to one side to help secure in position. 3.Use your template and cut two large stars from Gold Mirror Card and two slightly smaller from the gold dotty paper within All That Glistens, then adhere the smaller stars centrally onto the larger stars. Cut one medium star from the dark music pattered paper and one smaller star from the gold dotty paper and adhere the smaller one to the larger one as before. 4.Stand the box section up and adhere the two large layered stars, one to the back and one to the front, so the pattern papers both show frontwards. Position so a point is at the top and 2 points at the bottom just touching the surface to help your design stand up. 5.Die cut individual letters to spell out ‘Happy New Year’ from the large gold dot and dark patterned paper. Arrange the letters on the star and glue in place using a clear drying glue. 6.Die cut seven fancy stars from the dark music pattern paper. Use your template and cut four small stars from the gold dotty paper, layering one fancy star die cut onto one small star using clear drying glue to make four layered Stars and three separate die cut stars. 7.Die cut individual numbers to make ‘2019’ using the Gold Mirror Card. Adhere a number to the centre of each of the layered stars using clear drying glue. Also die cut one champagne bottle and two glasses from the gold Mirror card. 8.Cut strips of acetate approx. 1.5cm wide and glue a star to the top of each. Glue the champagne bottle to one strip and also two glasses to one strip, so you will have nine separate decorated acetate strips in total. Add a clear adhesive gem to the centre of the three plain fancy stars. 9.Arrange the decorated acetate strips as desired. When happy with arrangement trim the excess from the ends and glue in place inside the box section using the back and front panel as well as the 2 support sections to create a display with height at the back. 10. 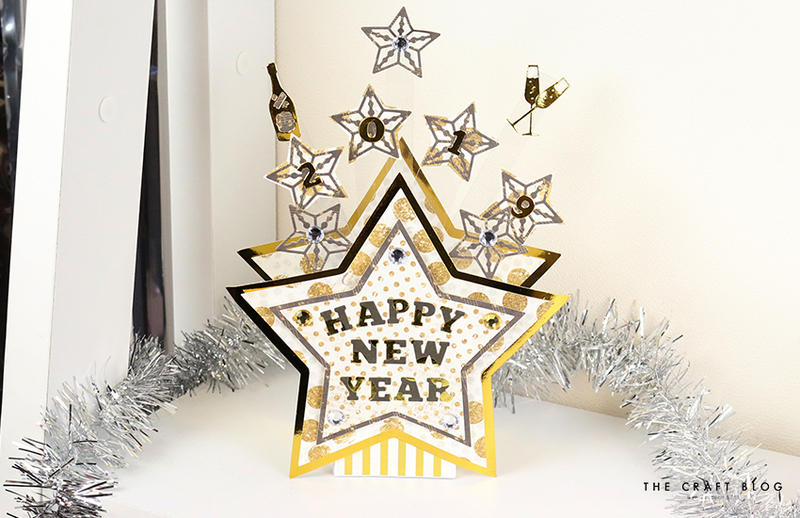 To finish, add the ‘Happy New Year’ star to the front panel using 3D foam pads and decorate with adhesive gems. Your card is now complete! Don’t forget to share your finished versions to the Inspiration area and to #Trimcraft when sharing on social media, we’d love to see. You can also follow Angela’s makes in the Inspiration area, or follow her on Instagram for more crafty inspiration. Absolut gorgeous work here, I´ll save the template for next year and hope I´ll get to try it then.